Description: Here is the French version of a 1935 $10 bill from Canada. It references La Banque Du Canada instead of The Bank of Canada. 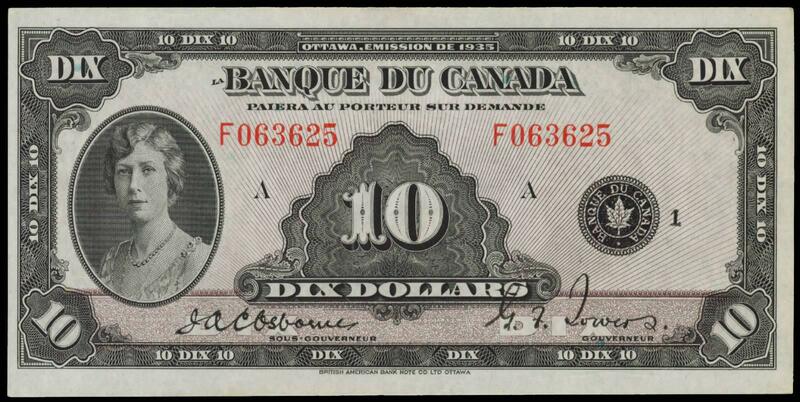 The rest of the text is also in French, with exception of the printer, The British American Bank Note Co Ltd Ottawa. The front of each ten dollar bill shows a portrait of Princess Mary. The back has an allegorical scene that is supposed to represent the harvest. This is the highest denomination from the 1935 French series that is still relatively affordable. See our guide below for more value information. We buy all French version emission de 1935 $10 bills from Canada. Values are based purely on condition and generally range from $100 to $2,000. If you would like our offer, then please send us pictures of your bank note. We will grade the paper money and respond back quickly with our buy and sell price. You might be surprised at how much money some high grade 1935 ten dollar bills are worth.